On behalf of JAINA Executive Committee, we wish you sukh shata on auspicious occasion of Paryushan and Das Lakshan Parv. It is a time for introspection in journey toward purification of soul. It involves examining our own actions/faults, gather good karmas while shedding bad karmas, requesting and granting unconditional forgiveness and initiate a spiritual journey that hopefully lasts a life time. Would you like to know the general meaning of Samvantsari Pratikraman and get more benefit out of it before performing this very important 3 hour long annual ritual on Sept. 17 this year? 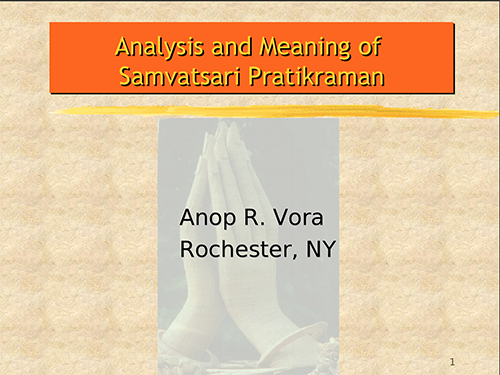 Clicking on the link will take you to a slide presentation on " Macro level Meaning of Samvatsari Pratikraman". It has been put together by Anop Vora, Past President of JAINA. As you review the slides, please be sure to read the explanatory notes as well. 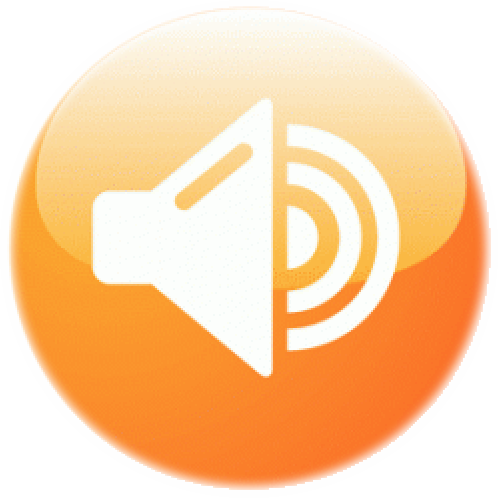 They have been revised to better explain the content of the slides. Hopefully, you're aware of the campaign to consider giving up dairy over Paryushan. 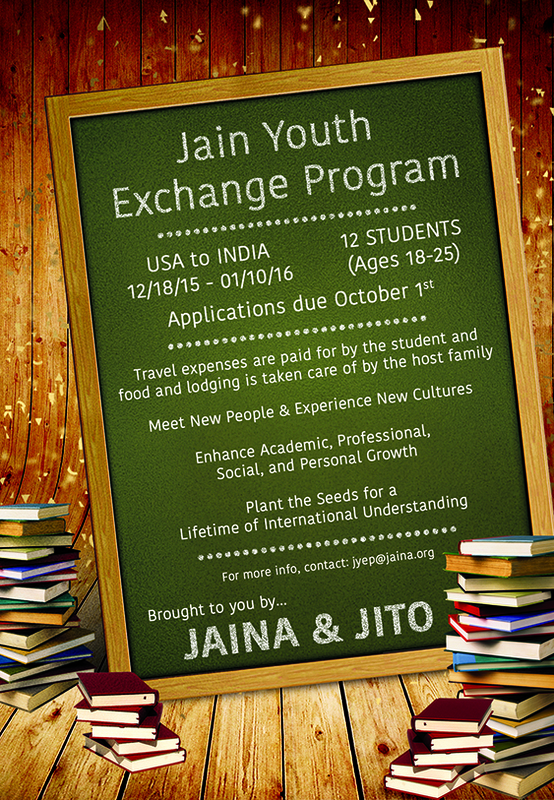 Introducing the Jain Youth Exchange Program! JAINA, Federation of Jain Associations in North America, in collaboration with JITO, Jain International Trade Organization, Ahmedabad (Gujarat) is proud to present the second phase of Jain Youth Exchange Program [JYEP]. JITO (www.jitoahmedabad.org) is the largest organization of Jain businesses, industrialists, and professionals in India. 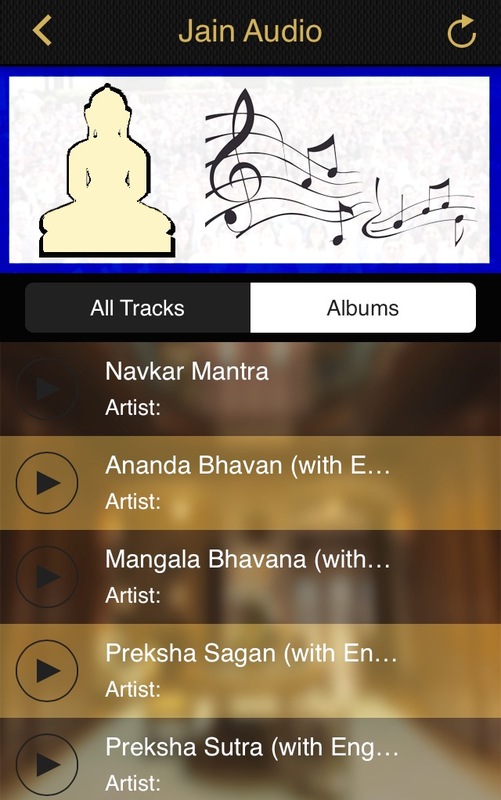 JAINA (www.jaina.org) is the largest organization of Jains in North America. The Jain Youth Exchange Program offers exposure to different cultures ranks as one of the most powerful ways to promote Indian culture and Jain way of life. The Jain Youth Exchange program intends to provide hundreds of young students with the opportunity to meet people from other countries and to experience new cultures, planting the seeds for a lifetime of international understanding. The program plans to offers numerous benefits to its young participants and their hosts and mentors, Jain leadership in India, as well as to the Jain community at large in India. Through Jain Youth Exchange, students learn first hand about all aspects of life in another country. As their concept of the world expands, they mature and develop a deeper understanding of themselves. Immersion in another country’s value system enhances their academic, professional, social, and personal growth. Host Jain Center's, families and the entire community are enriched by extended, friendly contact with someone from a different family/culture. For questions email jyep@jaina.org or call 510 730 0204.